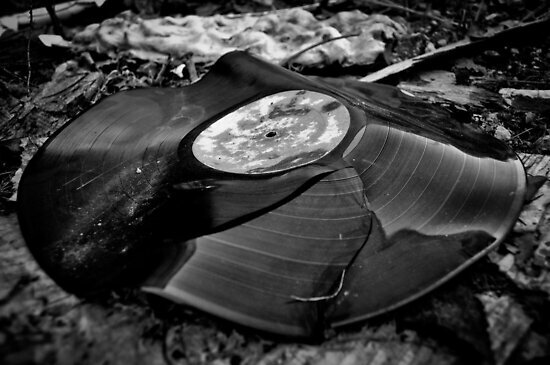 The latest news is that album sales are down. This is especially problematic logic given the relatively paltry numbers of subscribers these services have. It's hard to see how such a small number of users (20 million worldwide) paying $120 a year for a subscription service is devastating the industry. Especially when the data actually shows people who use these services are more likely to buy music, and more of it, than people who don't use these services. To put that in perspective, in just the USA, around 45 million people bought at least one download in 2011 or 2012. That's compared to 20 million music subscription users worldwide. Blaming streaming demonstrates a lack of perspective, and a disappointing willingness to point fingers at companies actually trying to improve the business for all particpants - artists, listeners, labels, and publishers. Here's one problem. There are no record stores anymore. Tower and most of the other big record stores went out of business long before streaming services had taken off (and in Tower's case, before Spotify even existed). If there are no significant retail outlets for music that are convenient or pleasant for people, they're not going to buy as much stuff. The record business was hurting long before streaming was more than an interesting curio. So what actually killed album sales? Was it the CD format, which some argue encouraged artists to bloat albums with even more filler? Maybe, but this is hardly objective and widespread enough to cause this decline. Was it Napster and other file-sharing services, which taught a generation of music fans to steal the songs they want, and forget the rest? Was it the perennial oldster gripe that "music is just no good anymore"? This one is somewhat backed up by industry decisions and data which shows that many post-1990s albums have no long-term catalog value: they do all their sales initially. This trend is not unique to music - many other forms of media (books, movies, apps) follow a similar power law pattern. Was it competition from other media and goods? Music fans today can spend their money on DVDs, Blu-Ray, digital video, MMORPGs, Xbox/PS4, apps, smartphones, data plans, and more. A more fundamental correction (in the economic market sense). For a long time, the only way to buy music was buying an album. Yeah, there used to be singles, but when big business took over the music industry in the late 70s/early 80s, they started killing that off or converting to absurdly pricey rip-offs like the cassingle or CD single...and even those were hard to find. If you wanted music, you had to buy the whole album, whether you wanted it all or not. This is like only selling cola in 3-liter bottles. Suddenly someone starts selling it in cans ($1 downloads). Big surprise: not everyone wants 3-liter bottles, and sales of 3-liter bottles drop. Maybe the music business was historically overselling and overcharging, and the current sales are what economics would "naturally" dictate. I don't know for sure. I do know it wasn't solely due to subscription services. I'd also argue the album isn't dead. There were more albums released in the last few years than ever before! Yeah, fewer are selling big numbers, but just because you or your favorite band isn't doing well (or as well as they used to) doesn't mean the system is broken. "Fidelity" means "faithful" and/or "accurate in details". The etymology takes you right to the Latin for "trust" (fides). Neil Young is still waving Pono around, and I keep hearing people who should know better talk about how "bad" recordings sound today. We can dispense with this pretty quickly. We'll just assume "the music is good". The artist knows what they're doing, and has good instruments, etc. It is generally true that back when recording was expensive and time-consuming, "the best" musicians got to make records. But you can go back as far as you like, all the way up to the beginning of audio recording, and you'll still find plenty of subjectively terrible artists and work. Garbage in, garbage out. If what you're starting with is "bad", it's all but impossible to fix. Musicians, get good instruments. Learn how to make them sound good in a room, on their own. Write good songs. Play them well. If you're a listener, choose stuff that comes from talented people, not products of the machine. 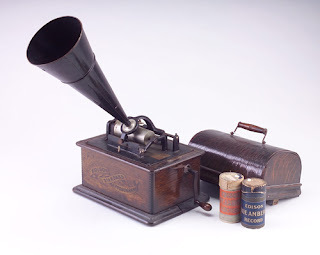 The very first sound recording devices - the Edison wax cylinder and its eventual replacement, the 78 shellac disc - sound horrible. Even with lots of digital remastering, the "horn" (basically a giant funnel) used to record, and the horn used to reproduce both add resonance, coloring the sound, and the media itself is not great. The entire system adds a lot of noise (as in "undesired signal"). Things got a bit better once electrical recording was developed, using microphones and amplification. However, in the first few years of the technology, electrical recording was considered vastly inferior to the established "warmth" and fidelity of the mechanical system. From the recording side, things didn't really get acceptable or decent until the 1950s, when there was decent tape and decent recording technology. You can find remastered recordings from the 1950s that sound great...for what they are. You will almost never mistake them for reality. It takes until the late 1970s for stereo to be standard, and for records to generally start sounding "true" to life, including widespread adoption of real stereophonic recording and playback. But even in that era, many artists focused on making "good recordings" at the expense of just "recording in a room" for a "you are there" fidelity. Classical and jazz are generally exceptions here, but not always - many canonical records from those genres feature tape edits of multiple takes and overdubs. Since that time, as recording tools have become more powerful, recordings have become hyper-real or stylized. Why stop with documentary photography when you can airbrush, enhance, or digitally create something "better than real", or "perfect"? The democratization of recording has placed powerful tools in everyone's hands. But those hands are typically far less skilled at actually using said tools, so you end up with lots of records that sound "bad" by most recording standards. To make good records, learn to use the tools, and use them appropriately. Some of the best-sounding records were made with 2 microphones in a room, and people who knew where to put them relative to the musicians. There are a lot of canonical, great records that sound terrible by most audiophile standards. On the listening side, it's taken a long time for consumer playback equipment to get good. Most cheap record players were and are awful. Most consumer tape players are not properly calibrated (and some can't be). They play at the wrong speed, too. Most listeners had no idea how to maintain them for optimal sound quality and used dull needles and magnetized heads to further destroy their media. The great thing about CD players - even cheap ones - is all of this went by the wayside. The difference between bad, decent, and great CD players is smaller than most people like to admit. The problems for most consumer audio playback is the end of the chain: the speakers or headphones. For most people, these are by far the weakest link. Sadly, those white earbuds that have become so popular are part of the problem, and their terrible fit and worse sound quality have helped perpetuate the myth that "MP3s sound bad". It remains fashionable among musicians and music fans to say "vinyl is better". Well, it isn't. At least, not in terms of fidelity, and not in terms of what most people can afford. Vinyl is demonstrably not faithful to the original recordings. There's surface noise inherent in the process. The theoretical dynamic range of vinyl is far lower than that of CDs. The available frequency range and accuracy are also narrower than CDs. There are frequently clicks and pops even on "virgin plays" (though quality control has improved somewhat). And you have to change your recordings to fit the medium: You can't have a lot of bass, and/or a lot of stereo information, without worrying about the needle getting literally kicked out of the groove. Records are fundamentally changed when mastered for vinyl - the high end is dramatically boosted on when the record is made, and then dramatically cut on playback. This is an attempt to reduce the high end noise (at the cost of increasing rumble). All of that is before you get to the actual record players many people have. Most record player manufacturers used the cheapest possible components to achieve something close to the desired effects above. There actually aren't even standards for tonearm angle, pressure, and other important elements that are fundamental to accurate reproduction. And strictly speaking, any standard "pivoting" tonearm is already terrible. You need a so-called "linear tracking" turntable (popular in the 80s) with an arm that moves in a straight line across the record surface to reproduce accurately. Records warp. They scratch easily. And on top of all that, because they are physical, mechanical things, the mere act of playing them degrades them. The Philips compact cassette doesn't inspire the same devotion as vinyl, but was also pretty bad. High noise (even with Dolby, which most people didn't understand), limited frequency response, and lots of tape alignment issues. And playing it also destroys it over time. The high fidelity audio world is populated by people who can be best described as "nuts". For people who value "truth", they cling to pseudo-science and voodoo. They spend $1,000 on special electrical cords to connect their gear to their home power. They buy oxygen-free speaker cable that "protects the signal from light" by insulating it with fluid or rubber or magic. Gaze into the mouth of madness. I'm not saying that expensive stereos don't sound good. But I am saying they don't automatically sound good. And that you don't have to spend a lot of money on your reproduction equipment to have a good experience. Get better speakers and/or headphones. You're probably listening to whatever you bought around college. Generally, the headphones that came with your phone or MP3 player are junk. For $100 you can get something decent. It makes a huge difference. Fix your listening environment. If you listen on speakers, where you listen matters a lot. Put your speakers at an appropriate height. Not too low, not too high relative to where your ears will be when you're listening. You want to be sitting in the "sweet spot" between the speakers. You want a room with a minimum of acoustically reflective surfaces. If you clap your hands and hear reverb or echoes, your music isn't going to sound right. If you're like most people, you stuck your speakers wherever they fit in your weird-shaped room. Pay attention. When you listen to a record, don't do anything else. Close your eyes. Or look at the cover. Get into the music. Just like how you might concentrate on the taste of a good meal. Listen carefully. Don't let the music be background, and it will immediately sound better. Get better music. Stop listening to music made on computers out of shards of other digital recordings (or at least go find some of the ones making deep, huge, beautiful works). Go find some 256 or 320 kbps MP3s (or CDs) of well-recorded, great music. All of this is a pretty long way of saying Pono is going to fail. This bums me out, because I like Neil Young's music. This is also unfortunate because its mere existence and continued discussion will further entrench the twin bad ideas that "regular old MP3s/digital sounds bad" and that the "fidelity" issue for consumers hasn't been "solved" yet. It has. By MP3s. Which (at 256 or 320 kbps, with a decent encoder) sound amazing compared to vinyl and tape. Science disagrees with Pono's fundamental premise. Even if Pono wasn't wrong here, the record companies are unlikely to release all of their catalog in this format (or any new format), making it similar to quadraphonic stereo, HDCD, SACD, DVD Audio, and various other "hi-def" audio formats that also failed due to a vicious circle/negative feedback loop of "no content, no users, no demand". But more importantly, most people don't care that much about fidelity to begin with. Those that do are pretty skeptical of digital audio (even though they're wrong to be). The average music consumer wants and expects all of the music they want to be available wherever they are, whenever they want it. They care far more about convenience than "quality" (and that is largely the short-sighted music business' fault), and they care about price above all. If you are reading this, you almost certainly are not the "average music consumer". But ask yourself this: When was the last time you took an hour, sat down, and really listened to something? "Fidelity" means being faithful - go be faithful to your music. Treat it right. Maybe get some new headphones, too. I work at Sony, I can get you a deal. "Coincidence that Pono rhymes with 'oh no'"